This hearty, healthy, protein-packed dish, is straight out of the heart of Punjab in North India. It is named Pindi Chana after the town where it originated - Rawalpindi (Pakistan) - in the days before the India-Pakistan partition. Easy to cook, it makes for a wholesome meal when served with bread such as Kulcha or Naan and a green salad. Pindi Chana can be made with dried chickpeas too. If you are using dried chickpeas, factor in the time to soak (overnight) and boil them before using in the recipe below. Set up a pan on medium heat and when it gets hot, roast the cumin and dried pomegranate seeds on it, stirring frequently. Remove from the heat when they begin to turn slightly darker in color and give off an aroma. When cool, grind the roasted seeds into a fine powder, in a clean, dry coffee grinder and then keep aside for later use. Heat a deep, heavy-bottomed pan over medium heat. Add the sunflower/vegetable/canola cooking oil and ghee. When they are hot, add all the whole spices - Badi elaichi, cinnamon, cloves, and black peppercorns - and fry until spluttering stops and the spices start to turn a slightly darker color. Now add the green chilies and fry until they stop spluttering. Add the chickpeas and all the powdered spices - coriander, cumin-pomegranate, garam masala, and amchur - and add salt to taste. Mix well to combine all ingredients together. Use the spoon to mash some of the chickpeas coarsely. Add 1/2 a cup of hot water to the mixture and stir well. Simmer heat and cover the pan and allow to cook until the chickpeas are very tender. By this time, the cooking oil you added earlier begins to come away from the curry. This is a sign that the spices are well cooked! The dish will also be like a very thick, chunky gravy by now. Turn off heat and put the Pindi Chana into a serving bowl. Garnish with the thinly sliced onions and lemon wedges! 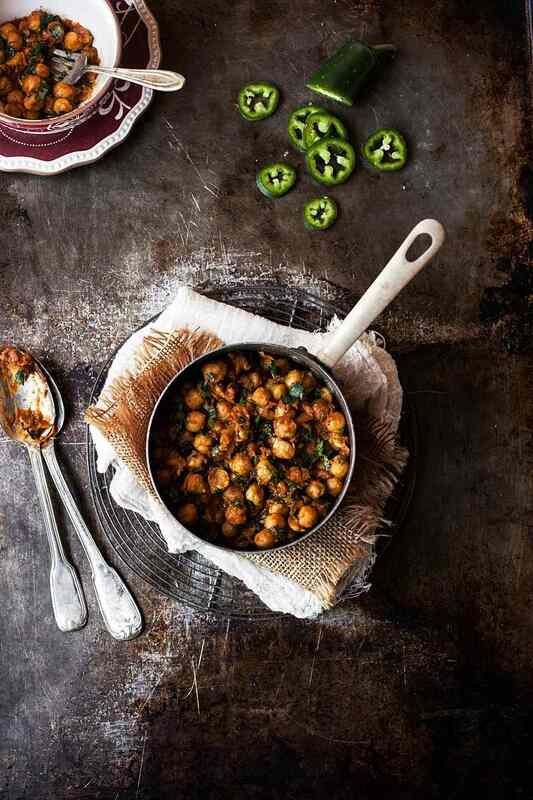 Pindi Chana is delicious with Naan or Kulchas and a green salad!